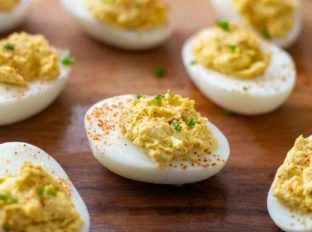 Deviled eggs are an easy classic Southern recipe that are a must-have at any party made with mayonnaise, mustard and a dusting of paprika and chives. Hand held appetizers are the secret to hosting a special occasion. A classic deviled eggs recipe is always a winner! We love serving our guests one or two bite appetizers including Shrimp Cocktail, Easy Sausage Stuffed Mushrooms, and the Ultimate Spinach Artichoke Dip. There are two camps when it comes to classic deviled eggs: you either love them or…not. We are on the LOVE them side of the debate! Knowing how to make a simple deviled egg recipe is a skill every entertainer needs to master and you’ll never buy the store bought variety again! 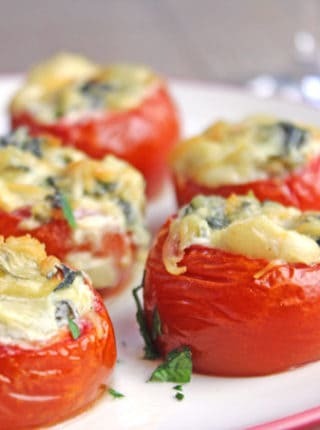 Luckily, this classic appetizer is easy to prepare and fun to customize in your own style. I sometimes like being unique and adding horseradish, hot sauce or dijon mustard for more of a punch too, some other members of the family like to mix in a bit of avocado or guacamole for a creamier mixture to add a healthier keto friendly fat. 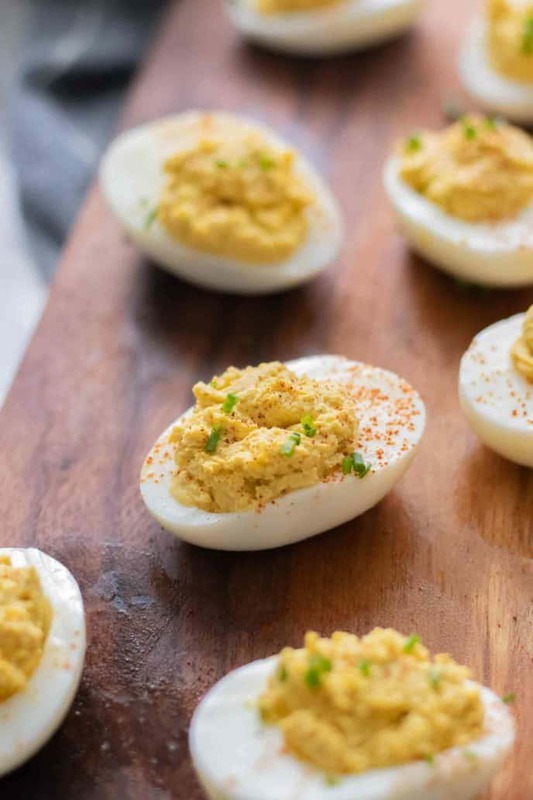 Deviled eggs are an easy gluten-free, low carb and dairy free staple at baby showers, wedding showers, Mother’s Day brunches, and birthday parties. The trick to making the best deviled eggs is to perfect the simple process of boiling eggs. That’s it! We’ll teach you how to have perfectly boiled eggs every time! Boil the eggs. Cool them in an ice bath then peel. Cut the eggs in half and remove the egg yolk. Mash the egg yolks with mayo and mustard as well as salt & pepper. Scoop or pipe the filling back into the cut eggs. Dust with paprika and sprinkle with chopped chives. 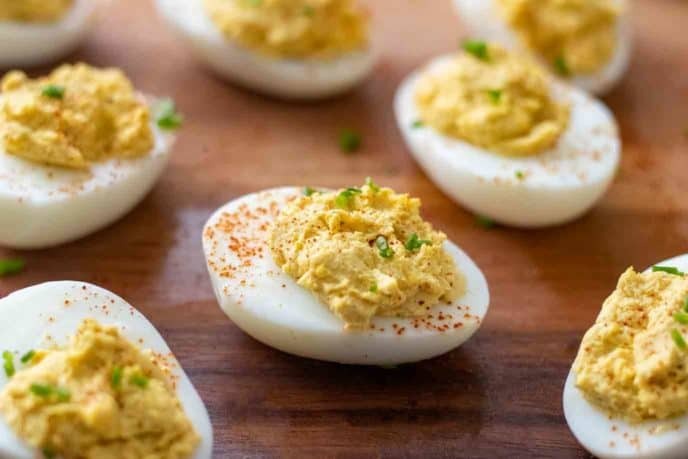 You can make deviled eggs up to two days in advance, although we recommend keeping the boiled eggs and the filling separate in the refrigerator. 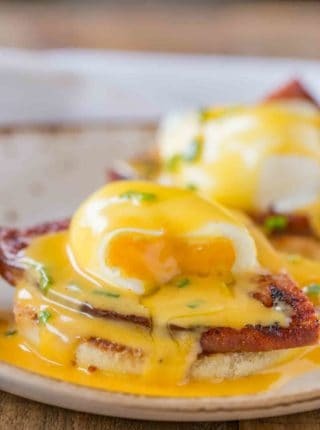 On the day you want to serve them, scoop the yolk filling into the eggs then keep refrigerated until it’s time to eat. How long will deviled eggs keep in fridge? Deviled eggs will keep in the fridge for two days. Peeled boiled eggs in general do not last as long as unpeeled boiled eggs because the egg shell is the protective layer that helps to keep hard-boiled eggs from spoiling. Pay close attention to food safety while making deviled eggs. While you prepare the filling, put the sliced boiled eggs in the fridge. When you serve your deviled eggs, leave them at room temperature for no more than 2 hours. Place the eggs in a saucepan with cold water covering them by 1 inch and bring the water to a simmer. Cover with a lid, turn off the heat and let sit for 8 minutes before removing the eggs and placing in ice water then peeling. 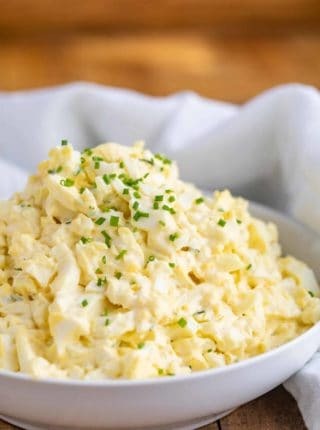 We boil a lot of eggs in our kitchen since one of our favorite lunches is Egg Salad on Homemade White Bread! 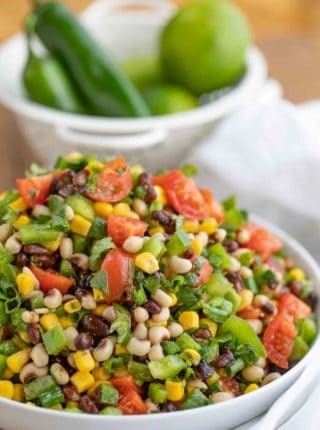 The culinary world describes “deviled” foods as hot and spicy. Most often we think of deviled eggs and deviled ham but other foods like kidneys and seafood could also be deviled. Our deviled eggs don’t have cayenne or other hot ground peppers, but mustard is a spicy ingredient and paprika adds another layer of spice and that devilish red color. Crack your hard boiled eggs before placing them in the ice water for 10 minutes to make them easy-to-peel. The ice bath stops the cooking process right away. Peel the eggs as soon as they come out of the ice bath, the peels should slide right off. Once you mash the filling, you’ll need to place it back in the egg whites. Use the rustic method and simply spoon a portion of the filling out and push it into the egg white with your finger. You could also use a second spoon to place the filling into the egg white. To make a lovely dome of filling on your deviled eggs, use a small melon baller or cookie dough scoop for well proportioned servings of the deviled egg filling. For a fancier method, fill a piping bag or a Ziploc bag with your yolk mixture. Snip the edge of the bag and pipe the filling neatly into the eggs. Use a pastry tip if you’d like a more defined swirl of the yolk mixture. Add 1 cup of water in the inner pot then add a steam rack and add the eggs to the rack. Cook on high pressure for 5 minutes then let pressure release for 5 minutes. Using a pressure cooker is an easy way to set the eggs and forget them, but be sure to still add them to the ice water once you remove the lid to ensure they are still easy-to-peel. Deviled Eggs with Relish: Add 1 1/2 tablespoons sweet pickle relish, squeezing out excess liquid. Bacon Deviled Eggs: Cook 4 sliced bacon until crisp then crumble, garnish on top of deviled eggs. Deviled Eggs with Pickles: Add 1 teaspoon dill pickle juice and 1 1/2 tablespoons minced dill pickles. Southern Deviled Eggs: Mustard, mayo, sweet relish, pimento and garnish with paprika. Eggs are an amazing ingredient in cooking and in baking. From breakfast to dessert, eggs are crucial to so many recipes. Here are more recipes where eggs are the star! 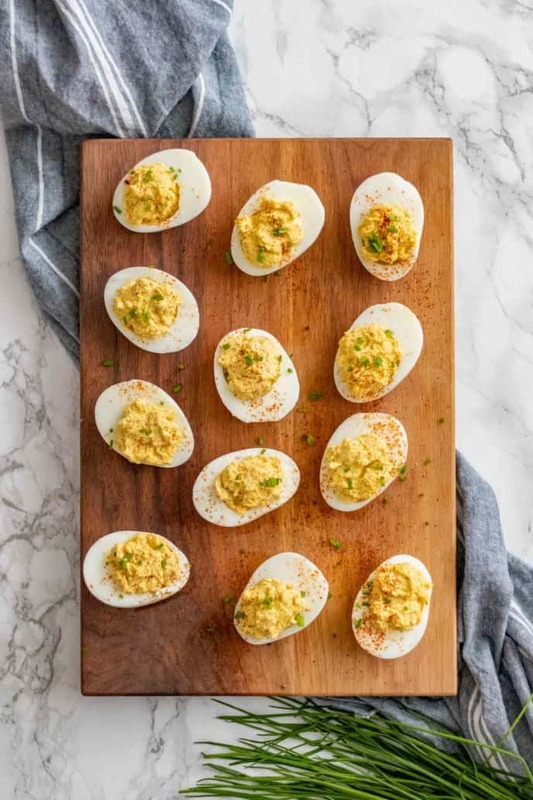 Deviled eggs are a classic Southern recipe that are a must-have at any party made with mayonnaise, mustard and a dusting of paprika and chives. Place the eggs in a large pot with cold water covering them by 1 inch and bring the water to a simmer. Cut the eggs in half lengthwise, scoop out the yolk, then mash in a bowl with the mayonnaise, mustard, salt and pepper before spooning back into the whites and garnishing with paprika and chives. Everyone at my house will love this! I love finding new deviled egg recipes that can be made simply in my kitchen. This one is a perfect fit! Bacon is always a winning idea! Once you start, you’ll always want them around. Love using the instant pot for the eggs! Deviled eggs are always a great side at holiday meals! Deviled Eggs are legit one of my FAVORITE apps! I love this version! Thanks, Alyssa! They’re so good so I don’t blame you. Whenever I make these, they disappear quickly! My kids just devour them.